My brother and I ate out quite a bit growing up so I think after a while a home-cooked meal was more a treat for us. My mom still questions how my brother and I know how to cook, and wonders where we picked up our desire to try new recipes. My mom is actually a wonderful cook (when she does it), but she cooked more for efficiency; cooking for an army so we could eat off of leftovers for the weeks to come. One story we always love to tell is about how McDonalds had a deal when the quarter pounder when the burger turned 25 years of age. McDonalds limited the amount of burgers you could buy at one time to 50, so we would order 50 at the drive through, freeze them and live off them until they were gone. I was about 16 at the time, so luckily my metabolism was working in my favor! As for nutrition? Well, at least we never have gone hungry! 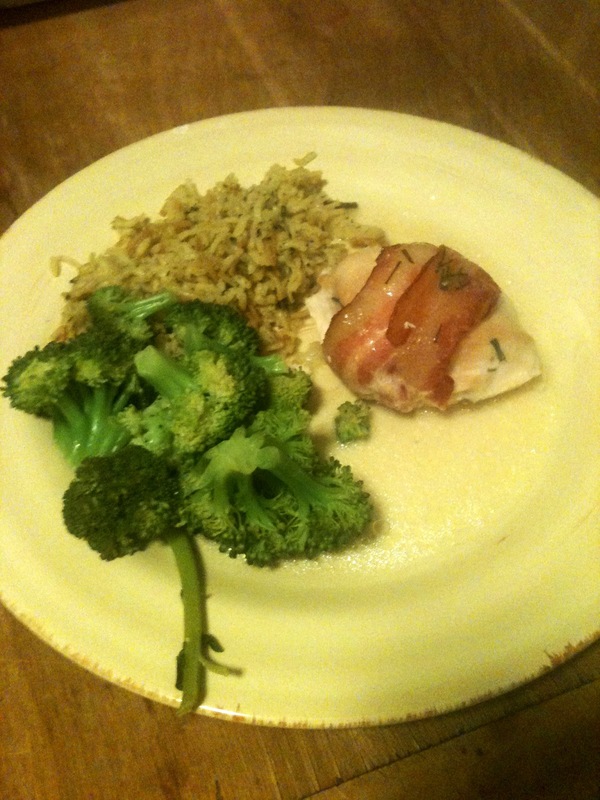 I pulled out this old favorite of 'Chicken Wrapped in Bacon' since the chicken was super on-sale. I'm not really sure where the recipe originated from, but I always requested it for my birthday (along with rice-a-roni and broccoli). I was pretty pumped to be able to use my chives from my patio garden! They are definitely growing like crazy - my next project is to figure out the best way to keep them so I can keep them for the winter until planting again next summer. Cut each breast into a size that you'd like for each portion. Beat until flat and able to shape around dollop of cream cheese and chives. In this case - I didn't want to splatter chicken juice all over my kitchen, so I beat it flat a bit, but then dug a hold in the middle and wrapped the chicken around the cream cheese filling. this looks like a lot of chives, but once they were cooked down, they really lose flavor - so I say add a lot! Next, I wrapped the bacon around the chicken and laid so smooth part of chicken is facing up. Make sure the majority of bacon is on top so that it cooks more (otherwise bacon may stay too raw). place small piece of butter on top if you'd like. Make sure to put the majority of your bagon on the top because it gets a bit less-cooked under the chicken. microwave the bacon to cook it a bit before you wrap and put in the oven. Finally - Bake at 350 for about an hour. Adjust based on the size of your chicken. Hope you enjoy this recipe! It's super easy as far as ingredients. We ended up eating pretty late since it takes some time to put the chicken together, but it's worth the time and effort. Bon appetit!